The title for this post are his words from his blog. Even that picture of a marching band comes from his blog; well, not originally. 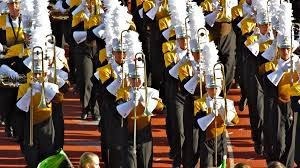 That picture is of the Davis High School Marching Band of Kaysville, Utah. Here is another picture.